They have a special allure that no other kind of garden seems to hold, no matter how grand. They can glow with life, hold you like a cocoon, fold over you and shelter you like welcoming arms. They can shine with bold fire that captures your gaze, demanding your attention. I think they deserve it! Do you feel cursed with your small garden and don't know how to work with it? Believe me, you have a diamond in the rough, all you need is a few key ideas. With these few ideas, and a little imagination, your garden will soon be dressed in high style. So how do you take the fear out of the garden design process when you are faced with that miniscule garden? Let's run down a few central ideas when putting together a small garden. Think about how to lay out the space in your small garden design in a way that will be unique and exciting. Learn some secrets to creating exciting spaces! Small gardens demand exhilarating garden beds! Turn up the heat by learning a few secrets about how to add the WOW! factor to your garden beds! Make your small garden design simple and easy to maintain! Plants that demand little care add up to beauty while remaining light on maintenance! Vertical gardening is a perfect solution when dealing with small gardens. High rise spaces are just as valuable in the plant kingdom as they are in real estate! Small gardens and bold accents go together. I particularly love to use this technique when creating any garden! Nothing has more impact than BOLD. Garden structure adds dimension to a small garden. Anything from seating to storage can be designed in, and ugly can be designed out! 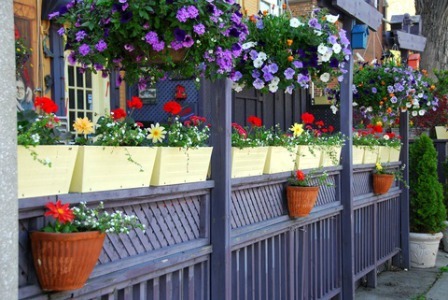 Plant containers with style add dimension to a small garden. Containers can be small, tall, big, broad, bright or retiring. They are always a great addition to your garden design. Patio gardens, even in the smallest of spaces, add livability to a small garden. A well designed patio made just for sunning or for reading a favorite book looks great and feels better! 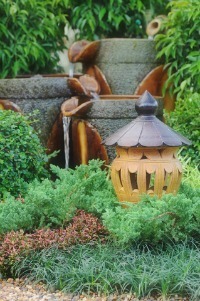 Water features are another no fail way to add dimension to your space. Large or small, deep or shallow, they all add a sense of permanence to your garden space, as well as the pleasant sound of water trickling. Now it's time to alter YOUR outlook! Embrace the challenge of designing that small garden space, and create a beautiful jewel of a garden. These ideas should jumpstart you and help you find a solution that makes your garden stand out.